With the lifestyle offered in Carolina Preserve, you might never feel the need to leave. But with everything the region has to offer, you will surely get the desire to get out and explore. The area surrounding Del Webb Cary is filled with trendy restaurants, large malls and intimate boutiques. Residents of Carolina Preserve have special discounted rate packages at four local golf courses. Several nearby colleges and universities offer continuing education classes to adults and provide great sporting events. Duke, North Carolina State University, Wake Forest and the University of North Carolina at Chapel Hill surround Carolina Preserve. Plus, the Raleigh Durham International Airport is only 10 minutes away, making out of town trips a breeze. Countless culture and entertainment venues are nearby including the North Carolina Museums of Art, Science and History. The North Carolina Symphony and North Carolina Theatre, Broadway Memorial Theatre, and Fletcher Opera Theatre provide great entertainment. Plus, as a resident of Del Webb Carolina Preserve in Cary, you are surrounded by some of the finest healthcare facilities in the country, including Rex Hospital, Wake-Med Cary Hospital, UNC Healthcare and Duke Medical Center. Those looking for a resale home by Del Webb in North Carolina should consider Carolina Preserve in Cary. 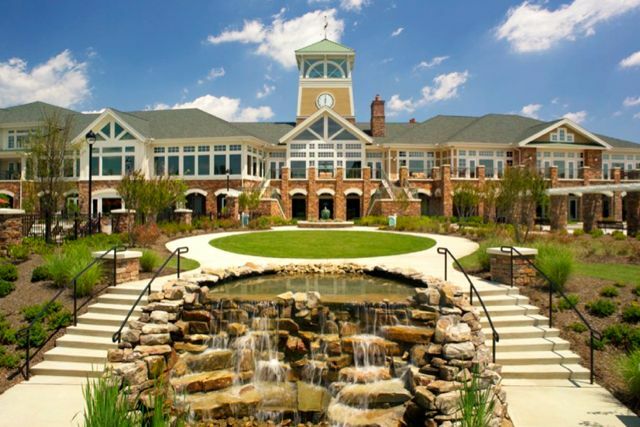 Carolina Preserve is a Del Webb active adult community in Cary, North Carolina. Located in the heart of the Triangle area between Raleigh, Durham and Chapel Hill, residents enjoy access to great culture and top-notch medical and educational institutions. World-class amenities, an active lifestyle and quality ranch homes have made Carolina Preserve a hit with active adults. Carolina Preserve is located in the prestigious Amberly master-planned community in Cary. Residents of the age-restricted Del Webb neighborhood enjoy exclusive access to a private clubhouse in addition to the shared use of an amenity center in the Amberly subdivision. The surrounding area is renowned for its proximity to great healthcare, continuing education, culture and entertainment venues, and great shopping and dining establishments. Cary continually ranks as a "Best 5 Small Cities to Live" by Money Magazine. Del Webb's Carolina Preserve contains over 1,200 homes spread across acres of gently rolling hills and towering trees. With over 100 clubs and interest groups, a fun-filled activity calendar and nearly every imaginable amenity, it is easy to see why retirees from around the country have flocked to Carolina Preserve in Cary, NC. Del Webb began construction of Carolina Preserve in 2006, it was an instant success and the community was completed in 2013. Homebuyers can select from homes that are available as pre-owned resale homes. The homes by Del Webb in Cary are designed to meet the needs of active adults and include desirable finishes, upgraded kitchens, expansive great rooms and ample outdoor living space. These homes are perfect for active adults who want a low-maintenance residence. Ranging from 1,217 to 3,500 square feet in size, the homes in Carolina Preserve offer two to four bedrooms, two to three-and-a-half bathrooms, and attached garages. Many homes feature dens that can be utilized as private space, entertaining space, or guest bedroom. With some homes containing optional basements and lofts, there is a home size and style to suit the needs and budget of nearly any buyer. Carolina Preserve in Cary, NC offers a lifestyle for active adults that is unmatched by any other 55+ community in the Raleigh and Durham area. An on-site community activities director is there to ensure you can custom build a lifestyle tailored around your passions. There are currently over 100 clubs and interest groups that include a wide range of social clubs, continuing education groups, sports teams and hobby clubs. Some of the more popular clubs include bocce ball, arts and crafts, dancing, golf, numerous card clubs, tennis and pickleball. Regardless of your interests, you will surely find other residents in Carolina Preserve who share your enthusiasm for living life to the fullest and attend activities at the nearby Amberly Center. In addition to the many clubs and interest groups in Carolina Preserve, there is a continually updated calendar filled with fun neighborhood events and social activities. Community parties, dances, day trips and a variety of fitness and continuing education classes are available seven days a week. Whether your idea of activity is touring local museums, attending charity events, golfing with your friends or simply mingling with neighbors, there is something for everyone at Del Webb's Carolina Preserve in North Carolina. Bradford Hall is a 34,000 square-foot clubhouse that serves as the hub for all community social events, fitness classes and sports activities in Carolina Preserve. The magnificent facility includes a state-of-the-art fitness center adjacent to an indoor lap pool. The fitness area includes high-end cardiovascular machines and weight training equipment, plus an aerobics and dance studio. The clubhouse also has a ballroom, demonstration kitchen, hobby and craft studios, library, varsity room and sundeck. Bradford Hall overlooks desirable outdoor amenities such as a resort-style pool with beach entry and spa, which is adjacent to four clay tennis courts, bocce ball courts, a putting green and scenic 15-acre lake. There are miles of walking and biking trails that wind through Del Webb Carolina Preserve and the adjoining Amberly subdivision. The community trails connect to the extensive Cary bike trail system including the historic Tobacco Trail between Raleigh and Durham. In addition to private access to the Bradford Hall clubhouse in Carolina Preserve, residents of Del Webb in Cary are also permitted to use the 12,000 square-foot Amberly Residents Club. This stylish multi-use facility includes a fitness center, event lawn, outdoor amphitheatre, Jr. Olympic pool, aquatic center and kids' pool.